This is a really interesting post, I don’t know that much about these topics so it is very educational, and great to see things from a different point of view. 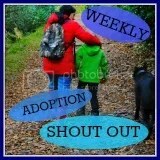 I just came across this from the weekly adoption shout-out. What a great post – I must read more of your blog. It’s really inspiring to hear your story and how you narrate it. It feels like you have been very reflective and have a very clear sense of who you are – I think that is a fantastic strength, and something that I aspire to. I’m an adoptive parent, my little one is still a toddler but as she grows up I really want to empower her to “own” her past and find the strengths that lie there. This type of post is really valuable to me, to see how I can help her mindset – and also to understand that it might take decades. Thank you. Thank you both for your comments. It is very difficult to be vulnerable in a public forum. Although blogging anonymously offers some protection, it is still important to have feedback on what is useful or valuable to others. I will do my best to include more reflective posts on my history, in the context of preparing to adopt. To ‘Mama’, I would like to point out that no one referred me or my family to safeguarding. I was never taken out of that chaotic environment. I was never adopted. I did not have support or therapy as a child. And, more importantly, I did not have parents who, like you, wanted to help me understand my traumatic history or find my strengths. It took me decades because I did most of it on my own, and that is by no means the best muchless the only way for people to recover. Some of our cognitive abilities depend on passing through certain developmental stages. It’s a tragedy that children experience trauma that they are not yet capable of processing and integrating… primarily because it impairs their development. This has a knock-on effect and often perpetuates more trauma. I have the greatest respect for adoptive parents, as sometimes all you can be is one heavy-duty container for your child’s chaos until they (and you) are able to make sense of it.